The Temple of the Emerald Buddha, also called Wat Phra Kaew, is considered the most sacred temple (wat) of Buddha in Thailand. Wat Phra Kaew is located within the historic center of Bangkok (district PhraNakhon) inside the grounds of the Grand Palace. 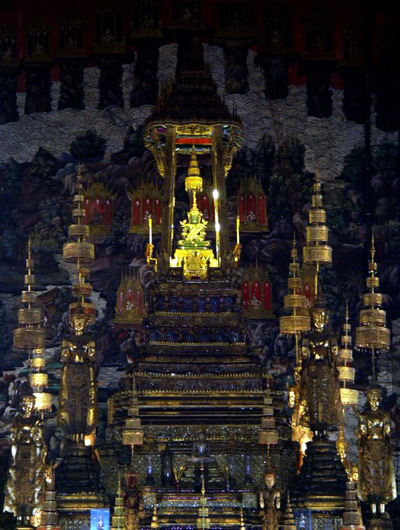 Within the temple is a valuable artifact called the Emerald Buddha Statue which is believed to be the idol that protects the city. The Statue of Emerald Buddha is made up of green jade (not emerald) and is dressed in gold clothes with a total height of 45 cm. As far as the history of the statue goes, it is said that it was made in India in 43 BC in Patliputra. The statue was transferred to Sri Lanka to keep it safe. In 1784, it was placed in its current home in Thailand. The structure of the statue is called the Jasper Statue. Tourists not only come to this place because of its sacred beauty, but also to adore and admire the beautiful statue that stands in the middle of the temple. It is green in color and covered with gold. It has three different sets of clothes which are changed only by the king when the seasons change. The sets of clothes that are not used are kept safe in Regalia (public grounds) for public display. The temple is like a personal chapel of the royal family and therefore does not house any monks. 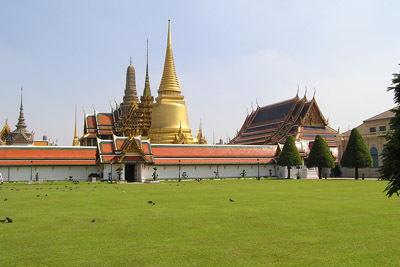 The entrance to the temple is in the rear and it faces the back of the Emerald Buddha Statue. To reach the entrance to the ubosot, the audience has to climb up to the terrace. The temple is covered entirely by a gallery, the outside of which is depicted with paintings from the Ramakien epic.